Going abroad always means some kind of adapting to a new environment. 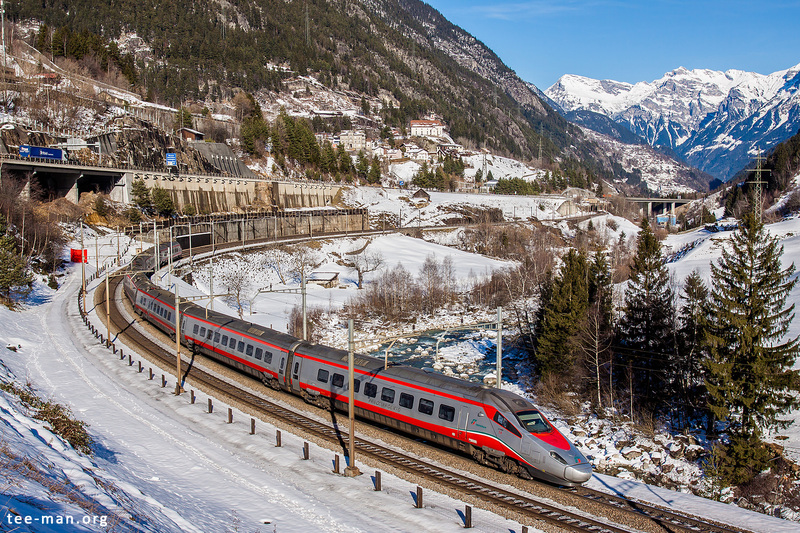 No different when we went out shooting along the Gotthard railway in the last winter before the opening of the new base tunnel. We were completely off as to when the sun would actually light the tracks, not thinking about the high mountains and wintertime. The dark valley was still nice to see, though, albeit a bit harder to photograph. It was especially hard to capture the contrast between very white snow and the dark rocks and trees. 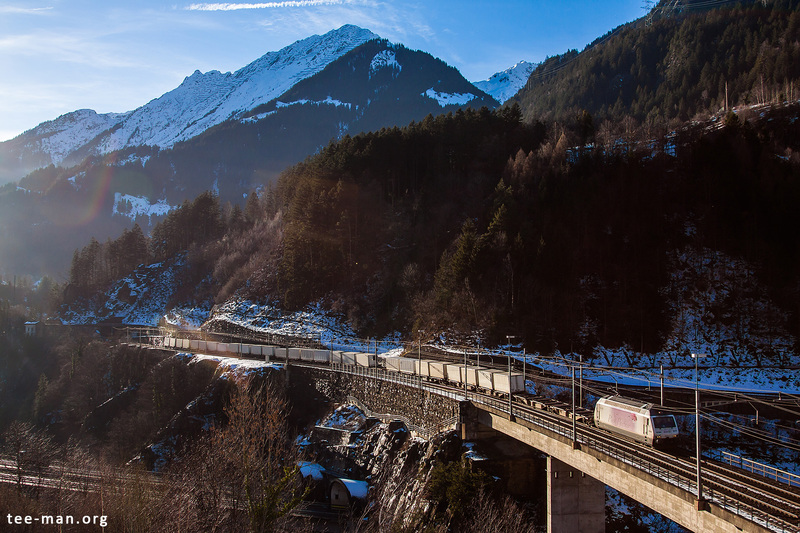 We would slowly see the sun rise above the mountains, but the first train still passed us in complete shadows. 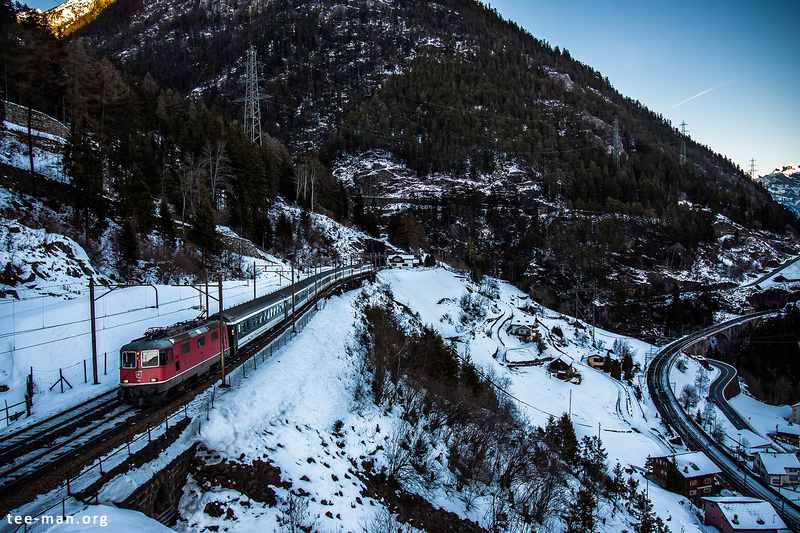 This is the start of a memorable week in Switzerland, chasing trains, good weather and having a lot of fun. Winter sun takes a while to rise, but its warm light makes the waiting worthwhile. It’d better, since temperature was also pretty low and wind was blowing. Fortunately, there were plenty of interesting trains riding up the hill. 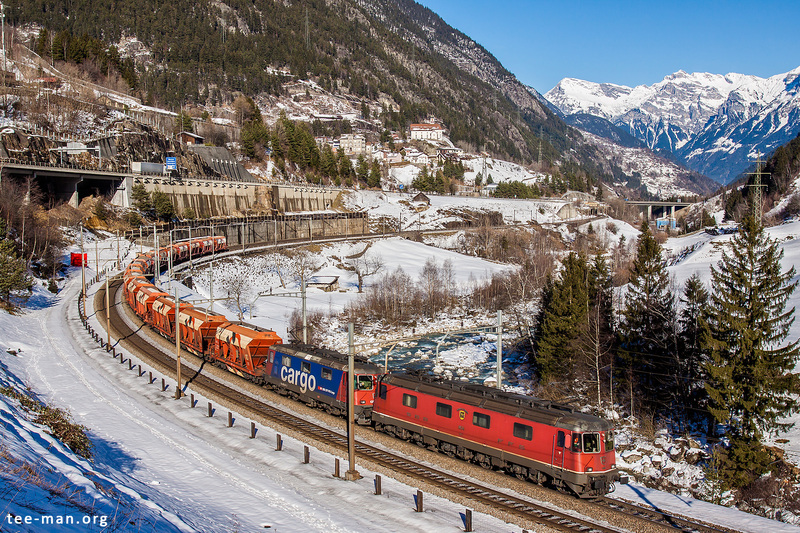 Like this one, straight from our home country: SBB’s 11683 and a sister haul train 40243 from Antwerp Oorderen to Gallarate, seen here at Wassen. While the bottom of the valley is still covered in shadows, the west-side is bathing in sunlight. The town of Wassen seems to be strategically located, getting sun early during the day. 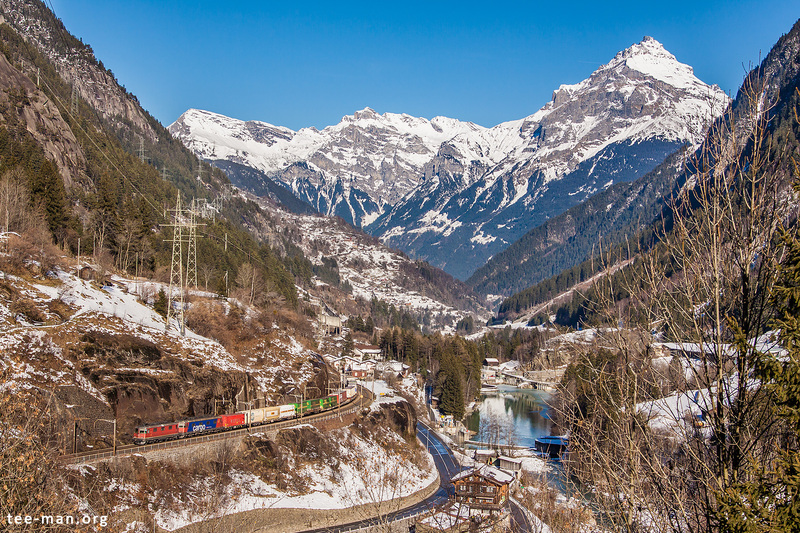 Train 67767 connects Hüntwagen-Wil with Sigirino – minutes before this sunny photo was taken, it was still riding in the dark part of the valley. 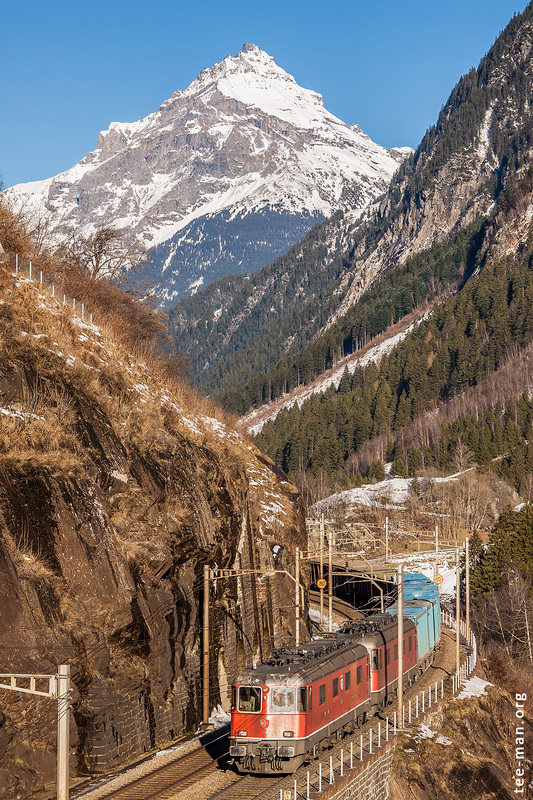 These trains transporting gravel (I guess) were a common sight on the Gotthard railway. You could even see several ones per day. Today, they ride through the new base tunnel, too. The church that on the previous photo was visible down, on the right, can now be seen in the middle of the photo. 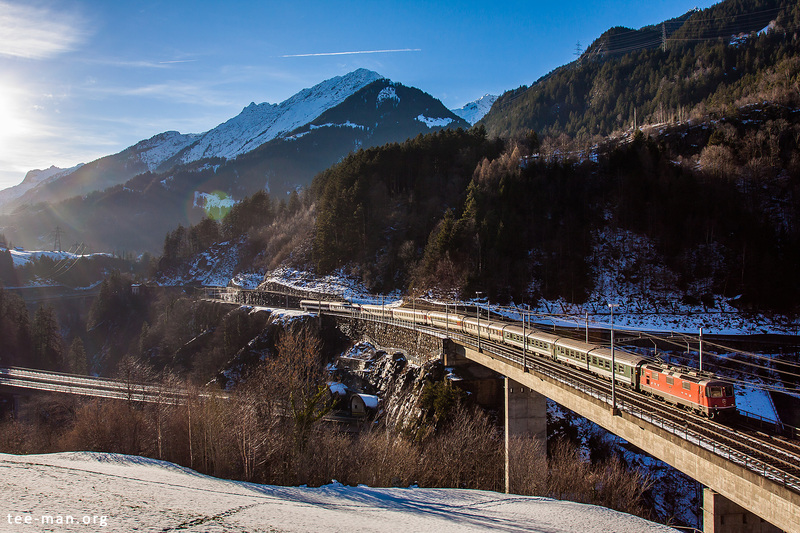 The train will pass it 2 more time before reaching the upper level of Wassen’s railroad. 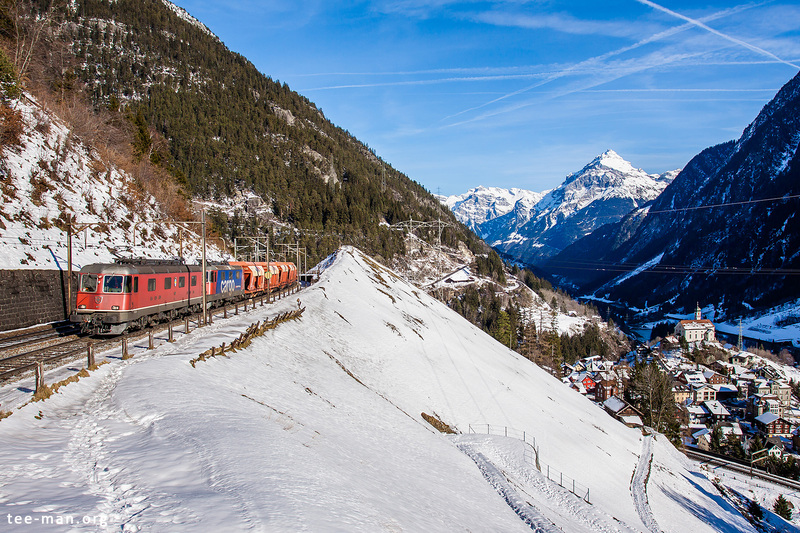 For the railway photographers this offers endless angles to watch the trains go by – the passengers get numerous different views of the beautiful valley. 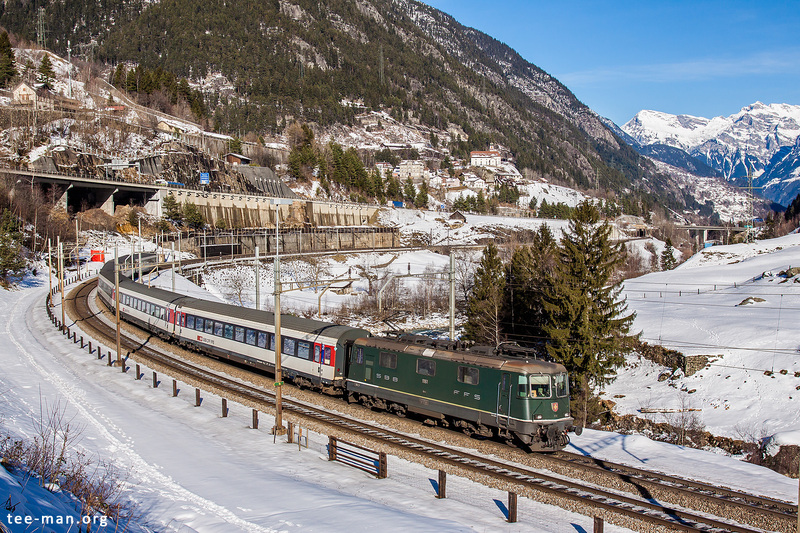 We were lucky to catch one of the few green engines left in front of this regional train to Locarno. It turned out to be a busy moment. Among other trains, we saw a Eurocity to Milano. And of course some freight trains. Did I mention endless possibilities before? A few minutes earlier we were making photos standing left of the house. A completely different view, necessary because the other view was getting boring with so many trains passing :). My grateful thoughts go to SBB for choosing a nice contrasting paint scheme for their locomotives. Sometimes you need to take a risk to get the shot you want. This is a viewpoint from the side of the road, but standing in a normal position there’s a cable hanging in the view… so lying down on the road was the only option to make this image. Only shortly before the train was at the right spot though, our ears the most concentrated of our senses. It was a short hike to get to this spot, where we got a great view with Chli Windgällen filling the background. It looks like a mountain with a view, doesn’t it? Maybe an idea for next year’s hiking trip. Time passed quickly, and before we knew it the sun was hiding behind the high peaks of the Alps. On of the spots where we would have some decent light left, was the viaduct at Intschi. From this viewpoint, you mostly see photos from earlier during the day. I think it looked good at this time also. 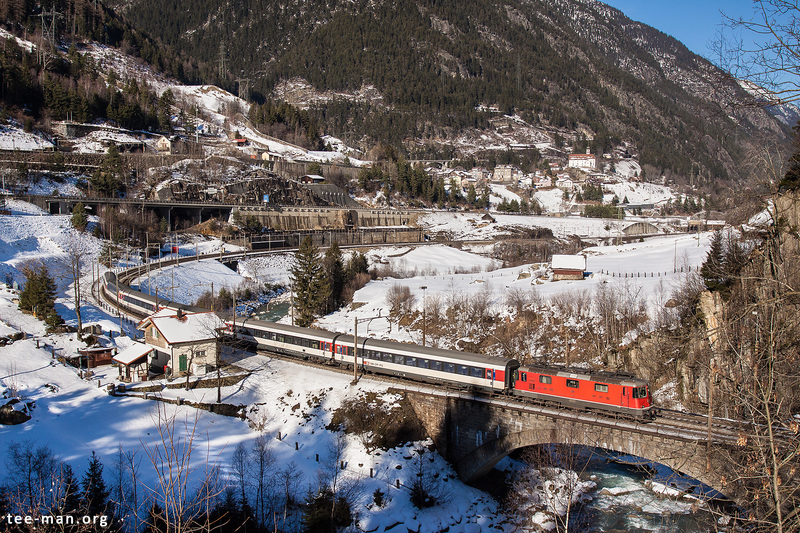 We were especially happy when this train passed us: the Railcare train from Chiasso to Hunzenschwil, hauled by a Re465 locomotive rented from BLS. We noticed something was wrong when we didn’t see any freight movements anymore for a while. 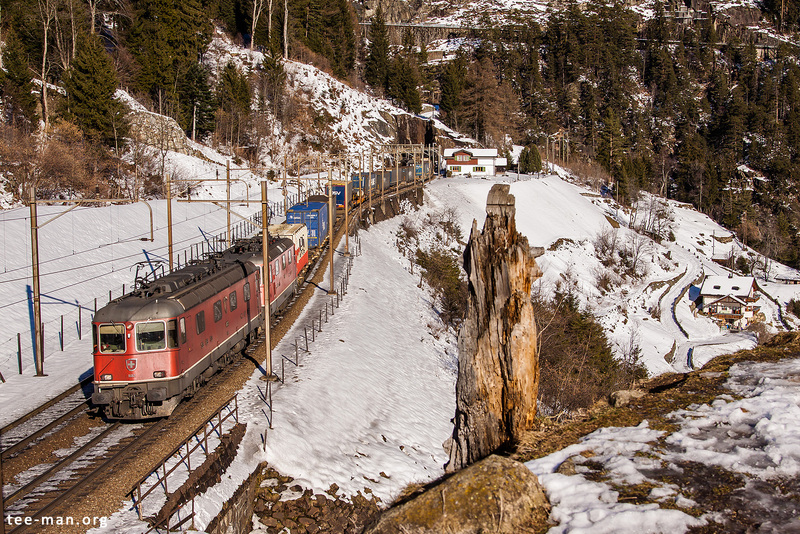 At Erstfeld, we found out there was a problem with the ETCS signalling system further down the line. 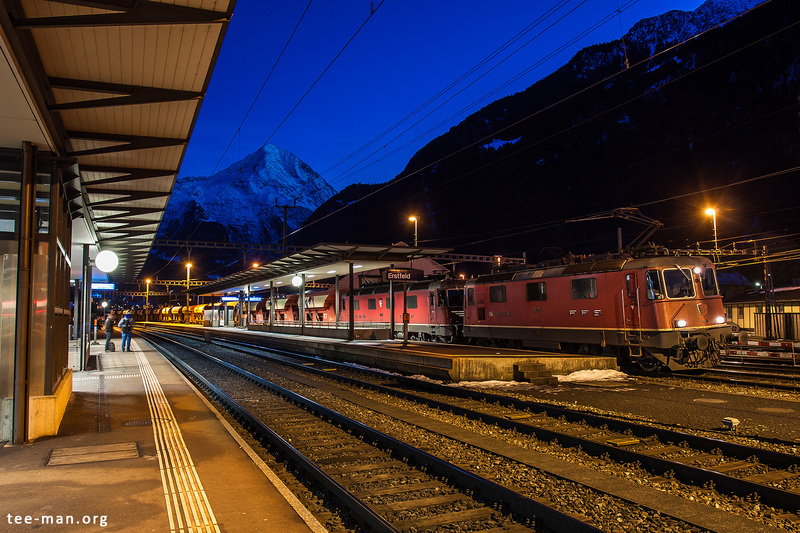 Trains were being held along the line… which gave us the opportunity for an evening shot at Erstfeld station, after having enjoyed a meal at the local train drivers’ restaurant. The blaue Stunde is well underway.